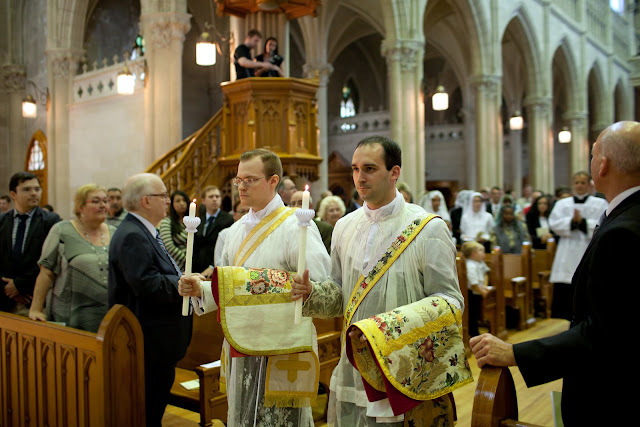 We take the occasion of the week of the Feast of Saints Peter and Paul to gather in one post the images of the three ceremonies of priestly ordinations for the FSSP in 2015, in the Nebraska, Quebec, and Bavaria. May 30, 2015. Solemn Pontifical Mass with Ordination to the Sacred Priesthood of six new priests for the Priestly Fraternity of St. Peter by The Most Reverend James D. Conley, D.D., S.T.L., Bishop of the Diocese of Lincoln, Nebraska, USA. Commentary by Fr. Justin Nolan, FSSP. Ordinations were held at the Newman Center's St. Thomas Aquinas Church at the University of Nebraska, Lincoln for Our Lady of Guadalupe Seminary in Denton, NE. A historical moment took place for the FSSP in Québec : on the 13th of June Deacons Jacques Breton and Alexandre Marchand were ordained to the priesthood in the traditional rite in the beautiful seminary chapel of St-Hyacinthe by his grace Archbishop Terrence Prendergast, S.J., Archbishlop of Ottawa. Deo Gratias! Father Hubert Bizard, vice rector of our seminary in Wigratzbad, was the master of ceremonies, assisted by seminarians from Our Lady of Guadalupe seminary (Denton, Nebraska), as well as by altar servers from St. Clement Parish in Ottawa. 3. Bavaria, Germany, June 27, 2015. In Lindenberg, Bavaria, near the Wigratzbad seminary, six new priests were ordained by the Bishop of Tarbes-Lourdes (France), Bp. Nicolas Brouwet: the Rev. Fathers Joseph de Castelbajac, Louis Le Morvan, Xavier Proust et Côme Rabany (Frenchmen), Elvis Ruiz Silva (Colombian), and Jean de Léon-Gomez (of the Dominican Republic). The whole set of beautiful pictures is available here.